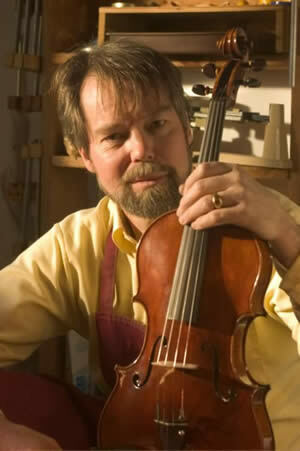 David Chrapkiewicz (Rapkievian), located in Washington Grove Maryland, is an award winning maker of fine violins and violas. David's shop - Rapkievian Fine Violins and Violas - also provides services such as violin and viola repairs, violin tonal adjustments and bow rehairing. David's violins and violas are featured on recordings of classical, popular, and folk music. David's violins and violas are noted for their beautiful workmanship as well as their exceptional clarity and balance of sound both onstage and in the recording studio. David has entered violins and violas in three international competitions and won awards in all three (2002, 2000 and 1982) including the silver medal for tone at the VSA International Competition in 2002.